Despite questions about how WTO accession will affect Russian industries, ordinary consumers are likely to benefit. If the supremacy of manufacturing is no longer recognized as the core imperative for a healthy economy, Russia can claim to be one of the world’s most advanced countries. It has now become Europe’s largest consumer market – retail trade generates a quarter of gross domestic product. In the past 10 years, personal consumption has been stubbornly overtaking production, and the gap between domestic supply and demand is increasingly being filled by imports. By all estimates, whether or not Russia joins the World Trade Organization, this gap will remain; the question, however is how the WTO will affect its size. Russia has already become a part of the global market without the membership. To see how it belongs to world economy in terms of satisfying consumer needs, it is only necessary to look at one of the best consumer market mirrors - retail hypermarkets. The rapid development of organized retail trade in Russia is an economic phenomenon that by itself proves the wonders market forces can do when they are not overregulated by red tape. The increase of personal incomes beginning in the last 1990s combined with a growth in domestic fixed capital outlays resulted in an explosion of organized retail trade, starting in Moscow and St. Petersburg and then extending to the rest of the country. In the last 10 years, retail trade in Russia has attracted over $20 billion of direct foreign investment. Today, Russian retail firms control over half the urban market in groceries, fresh produce, clothes, footwear, home appliances, cosmetics, pharmaceuticals; Russian firms maintain about 80 percent of the trade in electronics, including televisions, computer hardware and software and mobile phones. The largest retail network in terms of sales volumes is the X5 Retail Group. It was formed in 2006 by a merger of the popular retail chains “Pyaterochka” and “Perekrestok” and now manages 3,140 supermarkets, discounters and franchise retail outlets as well as traditional retail shops in western Russia and Ukraine. Auchan Russia, a subsidiary of the French grocery giant Auchan, is the country’s second-largest retailer: it already boasts 45 hypermarkets across the country and plans to triple its network by 2015. Most Russian retail chains have been copying the business model that has proved successful in the West: expanding a network of stores, increasing sales and reducing costs through economies of scale and a reliance on large suppliers. This model also builds customer loyalty by ensuring that shoppers can always find a variety of quality products at an affordable price. This business model has proven beneficial for domestic industries oriented towards end consumers. 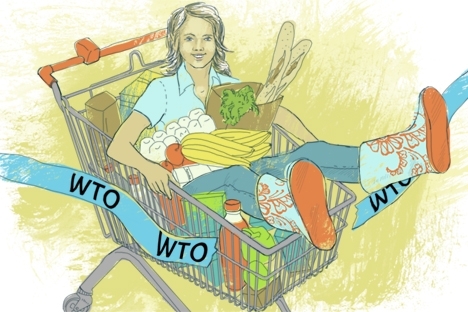 Without any hypothetical assumptions about what quality standards, price levels and competition they may face whether Russia is out of within the WTO, domestic producers are able to adjust their products to existing demand by seeing and copying or through initiating a partnership with a retail chain. It’s likely that with Russia’s accession to the WTO, price and availability of these imported goods will improve, to the benefit of Russian consumers. On a recent trip to the market, Auchan customers seemed more concerned with the price and accessibility of their purchases than their provenance. Potatoes from the Ryazan region, not far from Moscow were cheaper than potatoes from Israel, Egypt or Saudi Arabia, but they were also packed in a less-convenient way, which kept them on the shelves longer. The Russian garlic was offered in kilogram packs each priced at 107 rubles while more popular Chinese garlic was sold in packages of three cloves in small knitted bags for 18 rubles. Perhaps WTO access will also allow Russian suppliers to benefit from the marketing tools employed by their foreign counterparts. Even here, however, hypermarkets operating in Russia must be aware of the specifics of the local market. Since hypermarket chains have yet to branch out to many small Russian towns due to the challenges of logistics and infrastructure, small businessmen who operate in these areas buy goods at discount from hypermarkets in large cities. This market segment is served by such specialized wholesale chains as Lenta, Metro Cash & Carry and Selgros, which have had to learn to deal with a completely different type of consumer than buys in bulk in the west. Despite the many risks WTO accession entails for Russia’s undiversified economy, the expansion of organized retail inspires hopes that some consumer industries can benefit from the changes. As Russian businesses learn to adapt to the global marketplace, the Russian political elite may also embrace the view of Nikolai Semenovich, who was shopping at Auchan, and focus more on what it can do to make people’s lives better – such as making it easier for foreign firms to access local markets and partner with Russian companies. Felix Goryunov is a Moscow-based economic journalist who has covered international economic and trade issues for more than 30 years.